Online local business search engine company Just Dial Ltd, that is slowly trying to morph into an e-commerce marketplace, is adding new revenue streams by rolling out a new cloud-based mini enterprise resource planning (ERP) platform for vendors on its platform. Christened JD Omni, it will allow small businesses manage their inventory, billing and third-party logistics for both online and offline activity through a plug and play cloud-hosted system. The app for Omni will also feature bar-coding system and QR codes. "...you would see a lot of revenue coming from new products. O ne good example is the Omni system that we are talking about that would be a far most key to revenue because there is more to do with running a business. It is like a mini ERP solution. Once businesses sign in they would not want to migrate to another system because they get used to it. They do not pay much to be part of it on a monthly basis; so that is a huge revenue opportunity for us....," Just Dial founder and managing director VSS Mani said in a post earnings call with analysts. He added that this would be in addition to the revenue flowing through commissions from Search Plus among others. The company had started adding Search Plus or enabling transactions for ordering products or booking services in the past but is looking at a formal launch by next month with a new integrated app. It also has more than 25 Search Plus products live on its local business search platform. The company would be spending nearly Rs 100 crore on advertising and marketing the revamped product, Mani said. He also said the firm now plans to get more involved with vendors for its hyperlocal products ordering service. Although it would still steer clear of getting into an inventory-based model which makes it an asset-heavy business, it would get into delivering products for some categories with its own team to begin with and will outsource it in the longer run. The company has begun hiring people for the same. "It will initially start with our payrolls and eventually it has to be outsourced, because you need large number of people to do the stuff," Mani told Techcircle.in. This would pitch Just Dial with several hyperlocal product ordering and delivery startups that have launched their business in the last year. Firms such as Grofers and Peppertap among others have raised loads of VC funding fairly early in their lifecycle as investors have lapped on to the business opportunity. 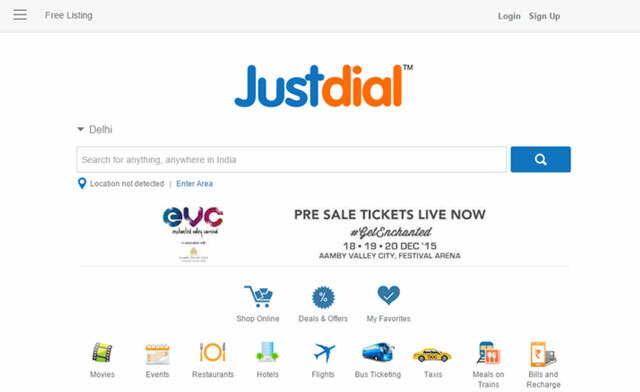 Just Dial posted an 18 per cent increase in net profit for the quarter ended June 30, 2015 on account of higher traction from paid advertiser campaigns. The Mumbai-based firm recorded a net profit of Rs 33.17 crore against 28.11 crore reported in the corresponding year-ago quarter. Income from operations increased by about 25 per cent to Rs 168.62 crore from Rs 135 crore in Q1 FY15. The profit growth was relatively slower due to higher tax payout ratio and higher employee-related expense. The slower profit growth and delay in formal launch of the integrated Search Plus platform had disappointed investors and led to a slide in its share price.